In our first apartment, we began to bake Easter cakes. For years, we had a Nordicware lamb-shape cake mold. We baked a chocolate cake (a black sheep, as it were), frosted it in vanilla and covered it with white flaked coconut. One year, we out grew the lamb, gave the mold away and moved on to a layer cake. The sides were covered in white coconut and the top was green-tinted coconut, the “grass” upon which we placed our favorite malted-milk speckled candy Easter eggs. After years of dying coconut, and with complaints from those who didn’t like coconut cake (you know who you are! ), last year we made this Speckled Easter Malted Milk Cake. Alas, lacking a good hand for smooth icing, ours didn’t look quite this pretty. We haven’t met anyone who can show us the trick. So this year, we’re minimizing the need for icing by going with a naked cake (see photos). A naked cake can have can have a light, uneven swath of frosting on the outside with naked cake showing through (see the nakedness here). Or, it can have no side frosting at all. That solves my particular challenge! Is a naked cake the same as a stack cake? No. A stack cake has zero frosting on the sides, just between the layers—and often just powdered sugar on top. A naked cake has an iced top, and can have a light swath of frosting on the sides (a semi-naked cake), as described above. Stack cake is an older concept from Appalachia; it was a typical wedding cake in that economically-challenged region. Each neighbor brought one unfrosted cake layer to the party (it could be any flavor), to be stacked with layers of frosting provided by the bride’s family. We like the concept of stack cake as a modern party idea—a pot-luck cake, as it were. Here’s how to throw a stack cake party. This Easter, we’re not going to ask everyone to bring a layer (maybe next year, guys). So we’re making a naked cake. We’re currently thinking orange pound cake layers topped with a great ganache. (It’s great when you make it from the best chocolate, like Callebaut or Valrhona). Make any cake and frosting recipes you like, 2 or 3 layers. You can add fruit to the frosting layers (raspberries, sliced strawberries). Thanks to the video below, we’re topping our cake a chocolate nest, filled with our [still favorite after all these years] speckled malted milk eggs. It is a really easy technique. You can find other nest recipes made with everything from shredded wheat and pretzel sticks to Chinese fried noodles and uncooked rice vermicelli. Trust us: The chocolate nests are easier—and taste better. You have plenty of time to practice: All you need is sugar water, melted chocolate, two pans, a bowl and a squeeze bag. 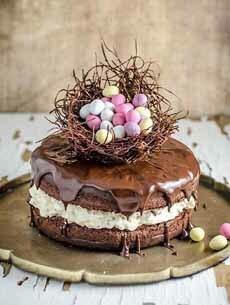 Here’s the recipe for this Chocolate Easter Egg Nest Cake from Chewtown. We used the chocolate basket recipe in the video below. 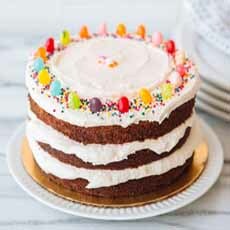 This naked cake from Black Jet Baking Co. is decorated with jelly beans and sprinkles (photo courtesy Good Eggs). 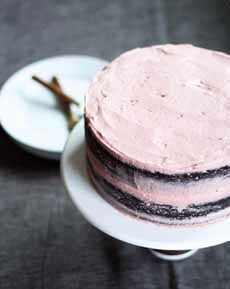 We prefer this type of side icing on our naked cakes (photo courtesy King Arthur Flour). Here’s the recipe with measurements. Note that this recipe makes individual nests. For a cake of 8-9 inches diameter, use a bowl as your mold instead of the foil. We did not make the leaves or feathers shown in the recipe, but instead filled our basket with malted milk eggs.